ilFornino® Professional Wood Fired Pizza Oven arrives seasoned and ready to use. Table-Top oven can be placed on an island or similar support structure. Cooking area is large enough to fit 4-5 12” pies. Thermal mass is about 4-6 Hours. It includes a starter Brush/Scraper, a starter pizza peel, 4 carrying handles, and the user Manual. ilFornino® Wood Burning Outdoor Pizza Oven is proudly assembled from local materials in Valley Cottage, New York. 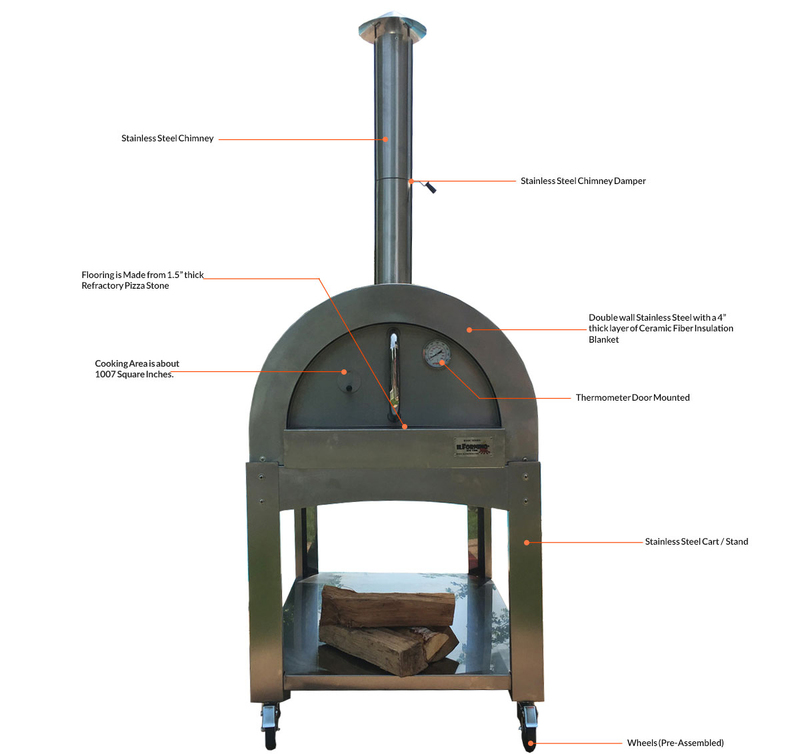 I have purchased Professional Series wood fired pizza oven from ilFornino. My Family is using this oven from last 3 months and they haven't faced any problem while using it. No complaints here. Highly Recommended!!! Have this oven since last many weeks now. We love it and our kids consider think its really amazing cooking in this oven. I finally have a pizza oven! Got one of these for my GMG Jim Bowie and am amazed! Cooked a Neapolitan style mushroom pizza in about 5 minutes. Construction of this unit is very solid. Can't believe it's available for this price. Great product!! I'd recommend getting a IlFornino professional series wood fired pizza o1ven for turning the pizza quickly. I was pleasantly surprised when my oven arrived. The Ilfornino professional Oven is well built and and it was very easy to set up. Amazing oven . We have cooked in it 2x so far..
Love it! It works great and looks nice and very easy to use. We made lots of pizza and a pie the first night and plan to experiment a bit more.